Heated towel rails make wintertime comfortable within your bathroom area. Available for any bathroom trend in multiple sizes and finishes. Choose the right style for your bathroom either chrome or black. Heated Towel Frames Please click on images to view our full range. The Thermorail budget range is manufactured with your budget in mind, these rails are manufactured to the same quality specifications as all Thermorails but using #201 stainless steel. Designed for modern bathrooms, the SS range features 28mm square vertical rails with 18mm square horizontal rails. 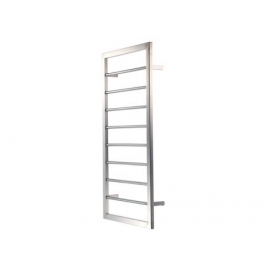 Minimum depth from the wall, these rails fit into tight spaces whilst allowing plenty of room to hang and dry towels. Inspired by nature, With profiles inspired by the natural environment, the sleek Forme range is designed to provide a timeless complement to today’s trends in tapware and other bathroom accessories. Crafted from high polish stainless steel, our Forme towel warmers are at home in any stylish bathroom environment. The Callisto Collection uses straight clean lines for a refreshingly simple style reflecting the latest influences in accessories with a comprehensive range for bathroom and shower as well as matching towel warmers. The art of simplicity Strong, smart and simple, the Genesis Collection of towel warmers offers sleek, contemporary sophistication without compromising on functionality. All of our beautifully crafted Genesis towel warmers are made from hard wearing stainless steel to provide designed-in durability. The non heated towel frame will complement other styled accessories and allow your towels to be beautifully presented and create a striking feature in your bathroom. Sensory perfection Strong, smart and simple, the Genesis Nero Collection of towel warmers with breath-taking good looks, offers sleek contemporary sophistication without compromising on functionality. Our beautifully crafted Genesis Nero towel warmers are made from hardwearing stainless steel, and finished in black powder coat, along with black decor trims if you want that little extra design touch. The CR range features round 32mm vertical rails with 19mm round horizontal rails, allowing more space for hanging towels and more airing space for drying. Designed for modern bathrooms with square fittings, the SFS range features flat 25 x 38mm Square Vertical rails and 20 x 40mm Suqare Horizontal rails. Minimum depth from the wall, these rails fit into tight spaces whilst allowing plenty of room to hang and dry towels. The SB34M rail combines the traditional heritage look with the elegance of modern living. These rails feature polished round tubes with ball joints. Thermorail enhances the bathroom experience by gently warming your towels to add that little bit extra comfort and warmth to your bathroom. The round floor to ceiling ladder features 50mm round vertical bars with 22 x 22mm horizontal bars. Designed to fit ceiling heights of 2300-3000mm and is cut to size on site. Unique to Jeeves, AHT is an intelligent, convenient and energy efficient method of heating bathroom rails which allows you to experience the luxury of a heated towel rail without the need for a manual temperature control or complex digital control panels. Jeeves heated towel rails include a built-in thermostat that is designed to automatically respond to temperature changes and ensure a safe heat level and automatically regulate energy consumption. The uncomplicated linear architecture of our Studio 1 Noir contemporary range in ultra-modern matt black, evokes drama and brings a touch of daring to your bathroom design.